Shankar Ehsaan Loy changed the way Bollywood music sounded with the seminal Dil Chahta Hai -- a film about a bunch of laid back city boys growing up and finding love. Eight years later, they are back composing for yet another coming of age film about a city boy who must grow up. In fact, the protagonist Sid even shares his name with Akshaye Khanna's character from DCH. Expectations are understandably high from this album, especially because the trio managed to capture the imagination of the urban young with the immensely popular Rock On! So does Wake Up Sid deliver the goods? The music does reflect the mood of the film and grain of the character, with five easy-on-the-ears, frothy pop-rock-country-blues inspired songs. You may even pick up influences of JJ Cale and Eric Clapton in the very bluesy guitar patches and laid back, stripped down arrangements in some. The title song (Shankar Mahadevan), Wake Up Sid for starters, is quite hummable with a catchy chorus section. As can be expected from the trio, it features some lovely, understated guitar riffs by Ehsaan Noorani. The song exhorts the protagonist to get up and get going, and the soaring scale changes towards the end help to pack in some more energy into the lively track. You're probably on the right track if Aaj Kal Zindagi reminds you of Luck by Chance or Dil Chahta Hai. Besides, the song's message of discovering a meaning in life, and a spring in your step, is something the trio have explored with lyricist Javed Akhtar successfully in the past. This is no different. Amit Trivedi, of Dev D fame, gets to score for Iktara, the only folksy number in the album. Ehsaan's sparkling guitar playing and his tone are to watch out for, while Kavita Seth's voice is intoxicating and earthy. The song however, is a bit underwhelming, with a rather predictable progression. Every moment you get the feeling as though the composer is leading you on to something spectacular, but ends with an anticlimax. And the piano/keyboard and violin at the end just kills it for us. This song had so much potential, really. life is crazy -- that has the potential to echo at college campuses and pyjama parties. It is a perfect singalong number, with hints of candy floss and first crush. The only remix, is actually quite a zingy track with a furiously ticking clock leading to the racier version of Wake Up Sid. In any case, the title track is probably the strongest one in the entire album, and if played well and wide, could be a hit. 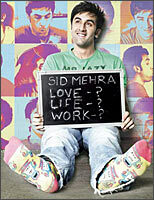 Sid, as we know by know loves his graphic printed socks, X-box and hanging out with friends. The music too sticks to the brief. It is hip, urban and bubbly, and unhurried. And thanks to Shankar Ehsaan Loy's musicianship, it is a slick, well-balanced production. What is disappointing however, is that it does not have that punch of Rock On! Or even the sensuality of Luck By Chance. Wake Up Sid, could be all that and so much more. Here's a tip, if the songs don't work for you the first time, give them another shot. Like so many of Shankar Ehsaan Loy's earlier work, Wake Up Sid too grows on you.